Don't forget to use the SDHC Extension 1.1 code when using SDHC. This will be essential for modifications that require more space later on in Dolphin. Dolphin emulator will begin throwing read errors if the virtual SD card contains more than ~1.95 GB of data is history! The Batch convert (pcs to pac) plugin will be useful for people who removed .pac files to save space for Dolphin. These .pac files are used for transforming characters, classic mode, Project M's All-Star mode, etc. Also, 4GB (or larger) virtual SD for Dolphin usage can be useful now! JOJI's website (Japanese language, English translation is coming soon) is a treasure trove of Brawlex relevant codes. Especially the engines that have tutorials mentioned below. Thanks to Lillith for making me realize the site is still being updated with new content. I'll link Google Translate's words of wisdom here. The website seems to redirect to the main page if you attempt to open links in a new tab which is weird. I haven't tested this personally yet since I don't use Wifi. I've personally tested it prior to Sammi's posting, and I can confirm it works. Good enough for me, thanks! I'm fairly confident that SoundBank Expansion System (RSBE.Ver) [JOJI] depends on smashbros_sound.brsar to be at a certain offset on Brawl's ISO. The code won't work for people who recompile their ISO with WIT from an extracted filesystem or use working around Brawlex's Final Smash Music glitch. Speaking of JOJI's code, there's a bit of a game-breaking flaw with it. If you use an Expansion SFX ID for a Fighter's Blast Zone KO cries, the game will crash upon being Kirbycided/Dededecided. Codes (no KC-MM nor SmashBoards profile) has came up with a fix for said issue, but due to JOJI's policy on wanting permission to distribute codes, Codes has sent him a PM with the fix. Though so far, there's been no reply from JOJI. The Tracklist Modifier v1.0 code causes Brawlex mods to freeze if a player backs out to the start screen and then pushes start again due to "Can't Alloc Heap Buffer." Use Song Forcer Codes or Tracklist Modifer [standardtoaster] instead. JOJI has been busy! Their website has some very useful codes! They ask that their codes not be posted on other websites. BrawlEx Clone Engine v2.0.0.0 Extended Edition allows for 242 moveset slots and their associated cosmetic data! See this for an example. The SoundBank Expansion System and Hitbox Sound Effect Change System got bug fixes! And BrawlEx Clone Engine Final Smash Music Fix (RSBE.Ver) actually works with the SoundBank Expansion System enabled! 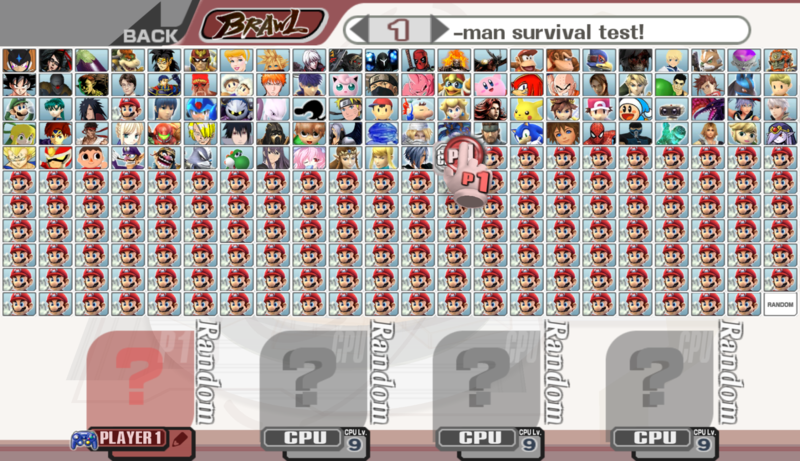 Using this modification without unlocking all characters in Brawl will likely cause a crash. My next idea is to isolate and remove the CSSRoster.dat dependency from BX CSS Expansion v2.0.0.x's sora_menu_sel_char.rel so the custom random and custom css codes can be used once again with Brawlex for loading more than 100 CSS slots. This is not going well however. At least PhantomWings told us what changes were made for alt CSP loading in BX CSS Expansion v2.0.0.x. PhantomWing's posts are helpful for learning how to edit modules. The external CSP loader more or less stands as it's own unit inside sora_menu_sel_char.rel (Common3's MiscData.rel file). The only reason it's paired up with the CSS Roster Expansion is that their hook points both happen to be in there. I'm pretty booked for this coming weekend and the next, so I don't think I'll be able to help you any time soon, but if you'd like to look into it yourself, you can take a look at the module in ResourcesCommon3 of the 2.0.0.x package and try to extract the changes yourself. There are 3 things that you'll need to copy out from the module into a vanilla sora_menu_sel_char.rel module. The hook is at section 0x1109C while the corresponding hook routine is at section 0x0. There's also a directory string at section 0xE40 that you'll need to copy and/or change depending on where you want to load from. Thanks for posting Lillith! I previously used the unstable BX CSS Expansion v2.0.0.x anyway so this is perfect for me! 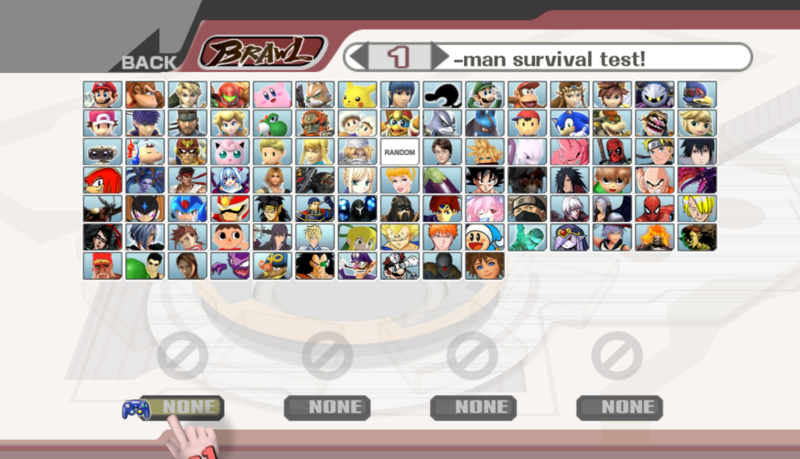 I can confirm the character select screen (CSS) portion of BrawlEx Clone Engine v2.0.0.0 Extended Edition (RSBE.Ver) works with both a real Wii and Dolphin. In my current setup shown below, I am able to use 101 CSS slots! 1. This is based on BX CSS Expansion v2.0.0.x and has its limitations. There will be significant lag on real Wiis when loading character selection portraits. This problem is minor on Dolphin Emulator though. 2. There are 2 versions of bx_fighter.rel included in the download on JOJI's website. One is for using special characters (ex. Warioman) and the other does not use them. 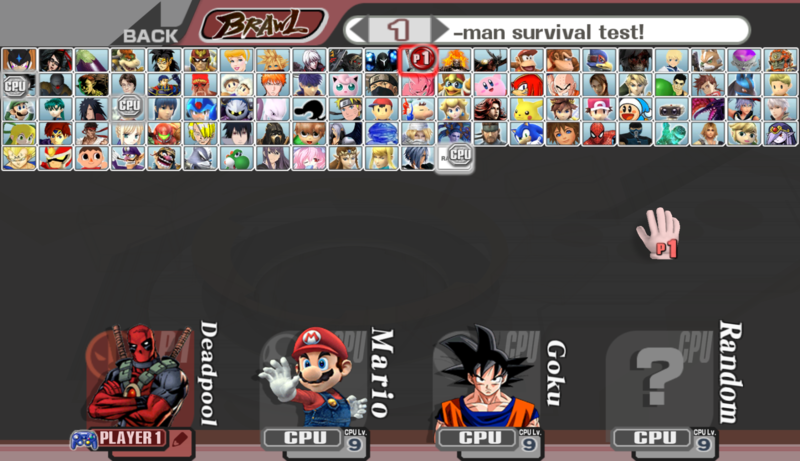 I haven't tested the special character version but it seems to modify some of the incomplete slots for characters not included in the final roster. This can cause problems if you've already repurposed those slots with elevated config files. The non-special character version had no problem with my elevated config files. 3. Now that a large number of movesets can be used in Brawl, there isn't much room for character names announced by the announcer. I've already replaced all of the Wiimote SFX and some unused sounds for 100 announcer names. I foresaw running out of space so I decided to remove them. I did this by redirecting or replacing the announcer names, "The Winner Is..", and team color names with blank audio files. I plan on seeing if the SoundBank Expansion System v1.4 works with announcer names in the future. * Bowser - for some reason Bowser is unaffected by this bug. The Fake slot works as expected. If you care about transforming or P:M All-star mode, place the normal Fake .pcs AND .pac in their expected locations too. Replace * with the character's name. Images (The sideways names are an experiment unrelated to Brawlex. I wanted to include names without obscuring images. I simply changed sc.selcharacter.pac -> MiscData -> 3DModels -> MenSelchrCname4_TopN -> Bones -> MenSelchrCname4_TopN -> nameNEn's rotation to (0,0,-90) and translation to (8.5,2,-0.3)). I'm liking what I see so far and this is going to be my new default setup! ...and typo in BrawlEx Clone Engine v2.0.0.0 Extended Edition (RSBE.Ver)'s fake slot alt paths. Fixed, sorry. It's impressive how this clone engine has advanced since it was first released. saves a lot of space and works around Brawlex's corrupted Fake costume path bug. Fit*Fake.pac loads as expected with this code. 50 Costume Code Implementation Guide is a neat modification that complements Brawlex but unfortunately is incompatible with BrawlEx Clone Engine v2.0.0.0 Extended Edition. Brawlex clone AI players tend to immediately use their Final Smash when possible. It's not exactly incompatible, but editing the v2 bx_fighter.rel is going to be tedious at best. Though in other news, Sammi Husky's looking into fixing Co-op Single Player crashing, incomplete SSE CSS, and Wii CSS lag with CSS Expansion v2.0.0.. So far, he's gotten the first issue fixed and is looking into the other two, but I don't see the Wii CSS lag being an easy fix. Page created in 0.832 seconds with 24 queries.